Last night I had a craving for pizza. But I wanted to try something new, something different than our ordinary pizzas. 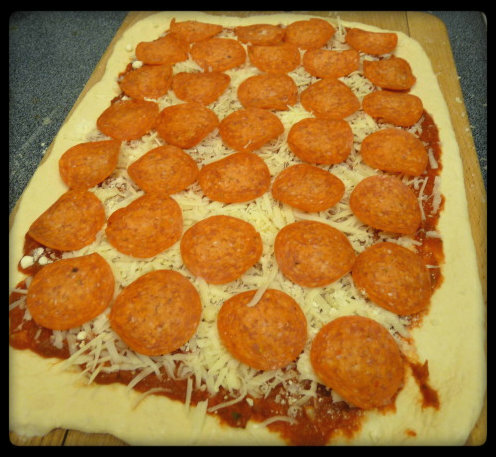 I had planned on making this great sounding rectangular pizza with a Sicilian style crust, but when I got home I realized I needed a 13×18″ rimmed baking sheet….something we didn’t seem to have. We do have an 11×17″, but would that work? I really have no idea and I sat and pondered it until ADD kicked in and I got sidetracked and then I stumbled on a recipe for pizza rolls. Well that solved the whole issue of the baking pan right there and come to think of it….a 13×18″ pizza was probably way more pizza than I could handle by myself anyway. Someday I’m actually going to plan out pizza night in advance. I’ve got all these great sounding recipes for making your own dough that call for allowing the dough to rise in the fridge for anywhere from 24 to 72 hours to get that perfect crust. But alas, pizza night always seems to be a last minute decision. So on days like that, I’ve got a quick recipe that only calls for an hour and a half. And on days like yesterday, when I still had to go the grocery store after work, sometimes I just pick up the store brand pizza dough (stores like Tom Thumb, Randall’s and Safeway have a pretty decent one). If your nearby grocery store doesn’t carry dough, most Mom and Pop pizza shops or Italian restaurants will sell you some dough (and even sauce if you don’t have the time/feel like making it). 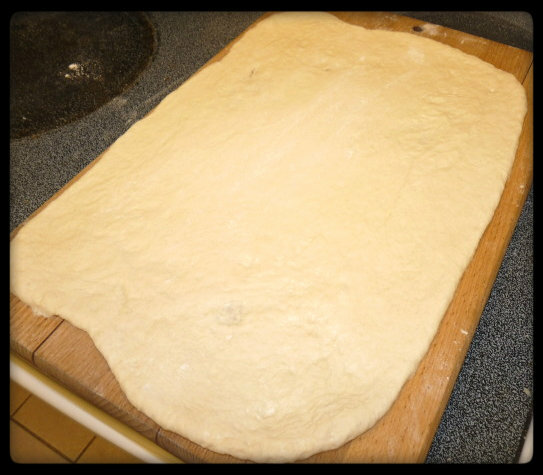 So anyway, roll out your dough into a rectangle, getting it as thin as possible. 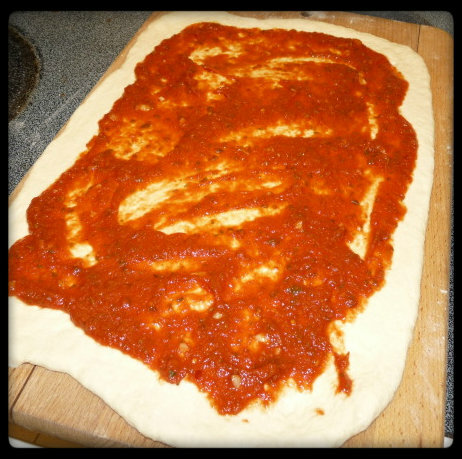 Lightly apply a sauce to your dough making sure to leave a border around the edges. 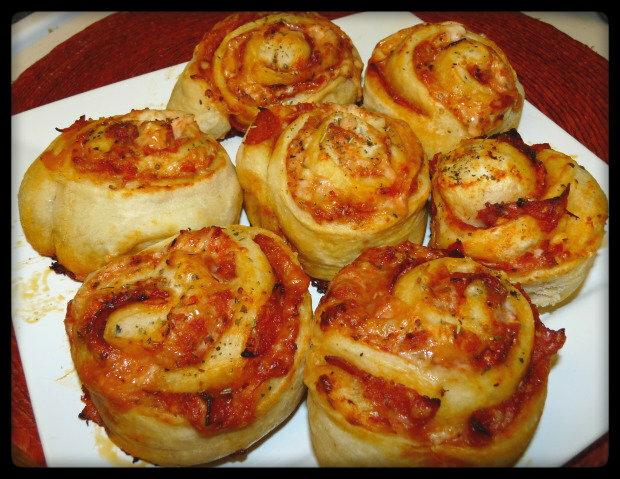 For these pizza rolls, I made a simple marinara sauce. Or use some store bought marinara or pasta sauce (if going this route, I suggest Buitoni which can be found in the refrigerated section). After saucing your dough, add your cheese and desired toppings. I’ve said it before and I’m going to say it again. Do yourself a favor and do NOT buy pre-shredded mozzarella cheese for pizzas. 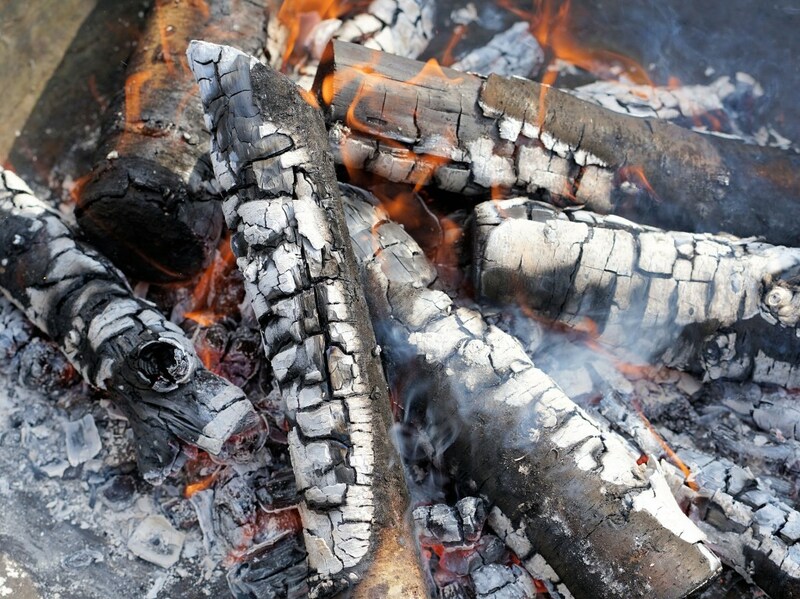 They add something to it after they shred it to keep it from clumping (I can’t ‘member what right now) and whatever it is keeps it from melting as well. Buy yourself a block of cheese and shred it yourself. Honestly, it doesn’t take that long and it makes all the difference in the world when making pizzas at home. 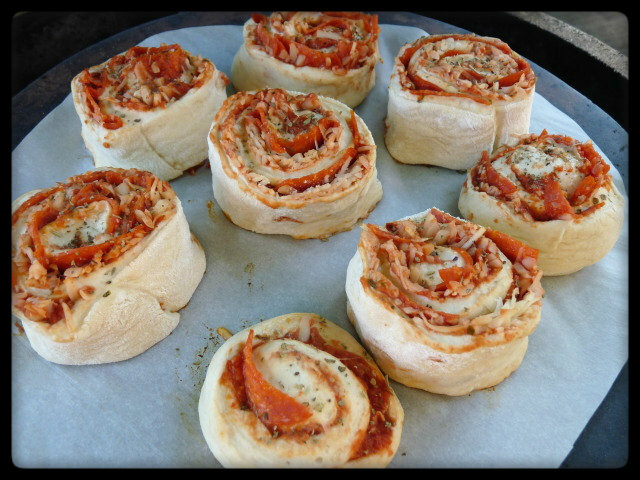 As for toppings, I decided to keep it simple and just used pepperoni as this was my first attempt at pizza rolls. 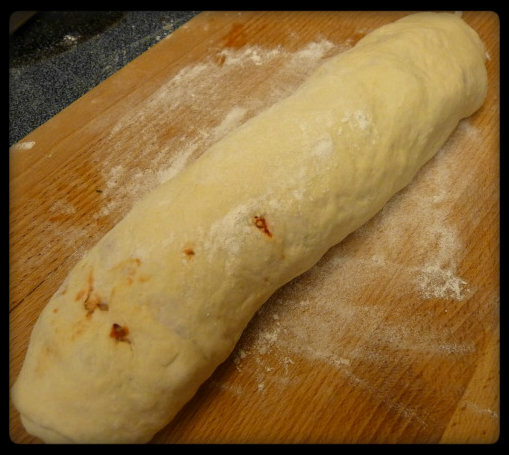 Starting at the edge nearest you, roll your dough into a tight log. This part sounded trickier to me than it actually was. Don’t worry if it isn’t a perfect cylinder, but try to avoid tearing any of the outside dough like I did above. And if you do, don’t worry, it will still come out ok.
At this point, I placed the roll into the fridge as I went outside to light my Egg and get it set up. I’m not sure this step is necessary, but my thought process is that it would cool down the log, causing it to firm up and allow it to be sliced more easily. I set up my Egg for an indirect cook at 450F. (If using an oven, I would shoot for 425, but the cook time might need to be adjusted). After getting the Egg set up, I sliced my roll into about 2″ sections and placed them on a piece of parchment paper before placing them on the Egg. Make sure to leave some room between slices to allow them to expand as they cook. On to the Egg at 450F indirect. After cooking for ahwile, these actually expanded until they were all touching each other. I checked on my pizza rolls after about 6 minutes and decided to spin the parchment paper about 180 degrees so that they would cook evenly. I also noticed at this point that the outer crust was starting to look a little dry and not browning up quite like I wanted them to. In order to help them out a bit I sprayed them with some PAM and allowed them to continue cooking. Based on a post I had read on the GreenEggers forum, I was expecting these to cook for about 12 minutes but the total cooking time turned out to be more like 18 minutes. Your times may vary depending on how thick your dough is and how big your rolls are. 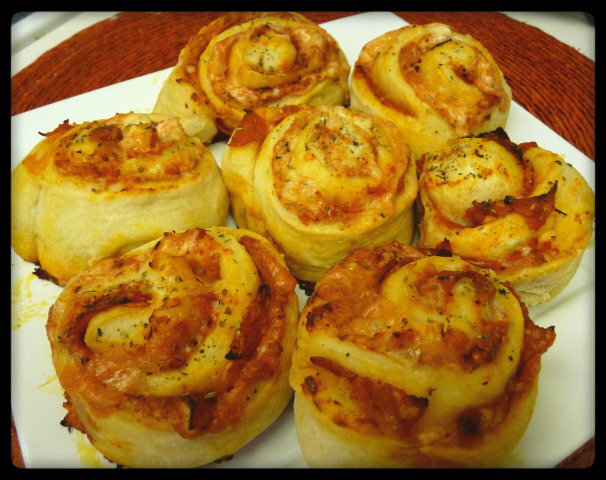 The pizza rolls were AHHH-Mazing!! I can’t even begin to describe how good they were. I inhaled two of them. Ok…I lie….three, but I should have stopped at two. Surprisingly, they were quite different from pizza even though they contained the same ingredients. I guess it had something to do with changing the ratios and the way the dough cooked up differently than it would have if it had been exposed to direct heat. If you are looking for an appetizer or are just sick of the same ole same ole pizza, I would highly recommend giving these a try. A little more work than pizza, but well worth it in my opinion. I would make sure my cutting board was well floured after rolling out the dough. I had a small issue with the dough trying to stick to the board when I began to roll them out. I don’t think I would serve them again as a dinner. I think I would make them as an appetizer. I wouldn’t make one roll out of a dough ball. There was a lot of dough in each roll and they were quite big. I would probably make two rolls and make them smaller, more like finger food. Before cooking I would add an egg wash or spray the outer edges of dough with PAM to help achieve a nice golden brown color. That looks awesome! What do you think of a Philly Cheese Steak Pizza Roll? Talk about a great tailgate food! That would be awesome!! I like the way you think. Very nice. I think I now have a hankering for some pizza rolls too! Genious. I should have offered to come over for dinner! And I would have let you if the maid had come. Note to self….get maid or clean house before Mrs. G comes home. Uhhhh, yes. With homemade ranch dressing. You’re doin’ it right. Mmmmm…..homemade ranch dressing. Thanks, Jen. You sure do eat well when I’m working out of town…you better make them for me soon! I’ll make them for you anytime you want, Hon. Just let me know when. My son said just yesterday he wanted some pizza rolls — good timing! 😉 these look yum! Hope he enjoys them as much as I did. If I had the time I would be making these today. Sunday night is often times pizza night so we might have something new to try this weekend. I hope you try them and I hope you like them. let me know how it goes. YAY for pizza rolls! DELISH! These are awesome. I love it!